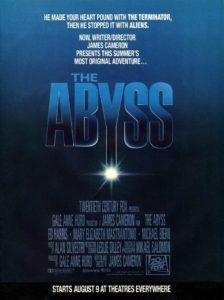 039a – The Abyss | All Eighties Movies. All The Time! This week we’re in neon neoprene, waaaay down deep as we find out juts what is living in…. The Abyss! THIS is my favourite 80’s movie of all time. Been willing you to cover it. Thank you so much. Can’t wait for part 2. My all time favourite movie from the eighties. This movie is beyond awesome. Can’t wait for part two. Love you both. You so love these movies and listened to heaps of your pod casts but felt I need to comment now as you say it is your ‘pay’. Can’t believe you DON’T get paid as your pod casts are so brilliant!